In the four years since taking over White House Farm, Oliver and Charlotte Gurney have turned it from a flagging pick-your-own enterprise to a bustling food destination as Clemmie Gleeson discovered. After six years as a Royal Marine, Oliver Gurney was more familiar with anti-piracy operations than managing a fruit farm, but in autumn 2012, he and wife Charlotte moved to Norwich to do just that. Fast forward just four years and they are now parents to daughter Olivia and manage the farm alongside an impressive portfolio of diversification enterprises, including a monthly farmers’ market and an award-winning farm shop. White House Farm has been in the Gurney family for 150 years, but joining the family business had not initially been part of Oliver’s career plan. But after six years, a health problem forced Oliver to have a rethink. Back in Norfolk, Oliver’s older brother Henry had taken over management of the family’s arable farm based at Coltishall, but since the retirement of its farm manager four years previously, the fruit business had been floundering. At this point, there were 16 hectares (40 acres) of fruit crops and a basic shed which acted as a ‘shop’ during the fruit season. With Oliver’s plans to leave the Marines and marry Charlotte in April 2013, his parents Richard and Margaret suggested they take on management of the fruit farm. Charlotte grew up in Berkshire and, after university in Exeter, had been working as a head-hunter for a major international computer company in London. She had no previous experience of farming and admits she was initially unsure if the business had potential. But those early days of meeting and talking to customers highlighted the potential. Despite having never baked anything before, she whipped up a selection of cakes in the farmhouse kitchen. So the decision was made to convert a cart shed into a cafe which now seats 30 with potential for a further 30 in the courtyard outside. The second diversification project was a farmers’ market in the courtyard and they quickly built up a following for the monthly events. 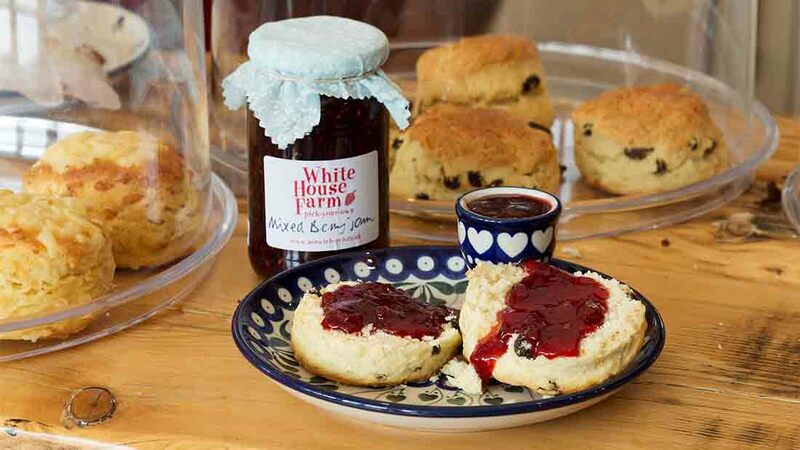 The success of the market gave them the confidence to launch project three – a farm shop. The shop opened its doors in 2014 and expanded to include a butchery counter with the appointment of butcher Steve Taylor in June 2015. And in February this year, the Gurneys achievements were recognised with the Farma Newcomer of the Year Award. Judges were impressed by the amount the couple had achieved in a short period of time and deemed the business one to watch in the future. In late November last year, Charlotte – then eight months pregnant – organised the farm’s first two-day Christmas market in a marquee in the courtyard. She says: “The weather was awful – it rained and snowed – but it was hugely popular. Daughter Olivia arrived on Boxing Day and, far from slowing down, the couple made it their first year for the shop and cafe to stay open through the winter. Use of social media has been integral to the business’ success, says Charlotte, who regularly updates Twitter and Facebook with photos and updates from the farm. She also writes for a local food magazine and makes the most of roadside signage which have both proven vital in attracting customers. A new road in development will improve accessibility to the farm and hopefully bring more customers through its gates. Networking with other fruit growers has proven invaluable and membership of Farma had helped them do just that. It was at a recent FARMA meeting in Swindon where they came across the idea of introducing a minimum spend or deposit for the PYO. Mowing regularly and keeping crops acccessible and well-presented for customers is costly too. So they now charge £2/person on arrival, but this is deducted from the cost of any fruit picked. While some customers have been annoyed by the fee, most understand the reasons behind it. Oliver benefits from the advice of brother Henry who now runs a PYO business in nearby Blofield. Although his business model is different to White House Farm, Henry’s aim to grow the maximum amount of fruit in a smaller area has inspired Oliver to condense his growing area. Since taking over the farm, Oliver has invested in modernising production to maximise yields. Step one was to decrease acreage to make the farm manageable for him with one farm worker. He says: “All the soft fruit used to be grown in soil. My next task was to put in tabletops for strawberry crops and start growing them and the raspberries in substrate coir. Similarly with the new cafe and farm shop, rotating crops is no longer possible. Oliver invested in trickle irrigation for the soft fruit. The combination of substrate coir, effective irrigation and feeding crops in accordance with advice from his agronomist has helped maximise yields. 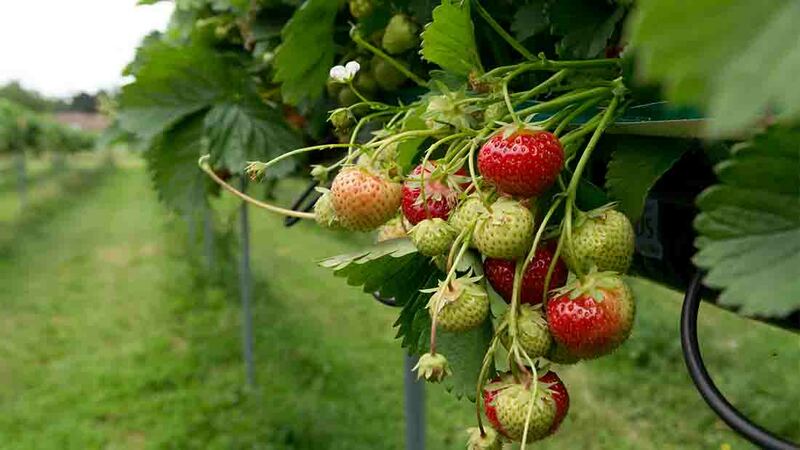 Strawberry plants are replaced every year, as this provides a more reliable yield, he explains. 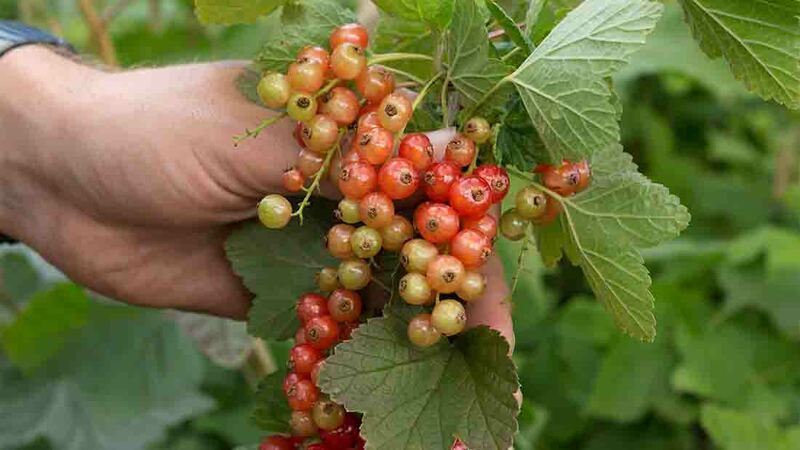 New plants are purchased from a grower near Kings Lynn, Norfolk, with some from Holland. Most strawberry crops are Sonata variety and this year Oliver is growing some of the Dutch variety Flair which looks promising. His raspberry variety of choice is Tulameen, while the apple orchard boasts about 20 varieties, including Cox, Katy, Russet, Jonagold and Bramley. Weeding is the most time-consuming task in fruit production, says Oliver. In the buildup to summer, planting new strawberry plants and potting up new raspberry canes takes a lot of time. Raspberries involve more fiddly work, while strawberries are relatively easy to plant into the coir bags. As for pests, Oliver follows a full spray programme developed by Dutch firm Delphy. He is also keeping a close eye out for spotted wing Drosophila. “It is relatively new to the UK and the best way to keep it to a minimum is to keep crops well picked and field hygiene levels high. This can be very hard in a PYO set up. His agronomist visits once a month. Plants are fed via the trickle irrigation system rather than more traditional fertiliser use. Acidic soil is ideal for soft fruit, but now Oliver grows all soft fruit in substrate coir, and not in soil, he can tailor it perfectly. Offering apples on a PYO basis has not proven viable, so instead Oliver has collaborated with a cider maker, who will take 90 per cent of the crop this year and will shortly take over management of the orchard too. Diversification project four is conversion of derelict farm buildings into business units which is well underway. Opening at the end of this year, there will be up to 12 units of varying sizes available for complementary businesses looking for a rural location on the edge of Norwich. Charlotte is currently researching ideas and applying for grants to partially fund the next project, which will be a children’s play barn.